Undiscovered Equities Supports Beyond the Boroughs! 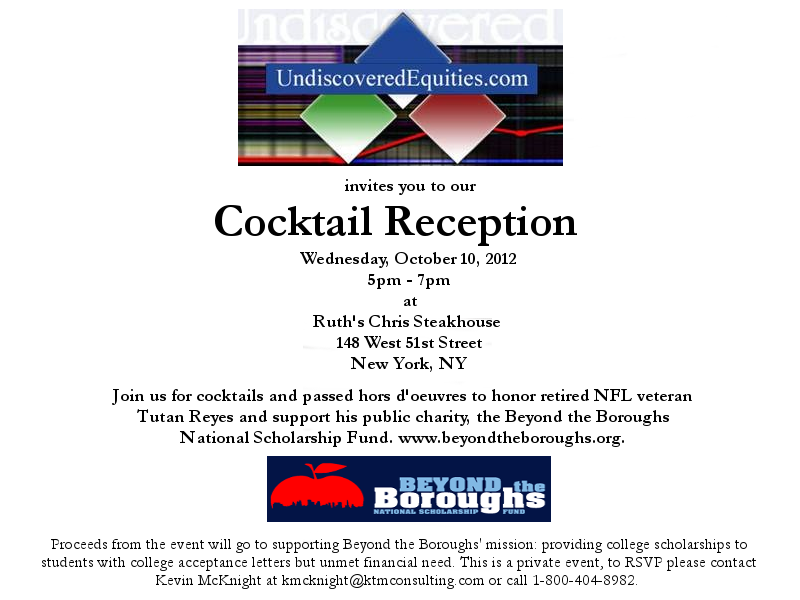 On Wednesday, October 10, 2012 Undiscovered Equities is hosting a Cocktail Reception to honor Beyond the Boroughs Founder Tutan Reyes and raise funds for Beyond the Boroughs. The reception is at Ruth’s Chris Steak House at 148 West 51st Street in Manhattan from 5pm-7pm. This is a private event, please email Kevin McKnight at kmcknight@ktmconsulting.com or call 1-800-404-8982 to RSVP. The Cocktail Reception is a part of Undiscovered Equities New York Small-Cap Conference. We are excited to partner with Undiscovered Equities to raise funds for deserving students. 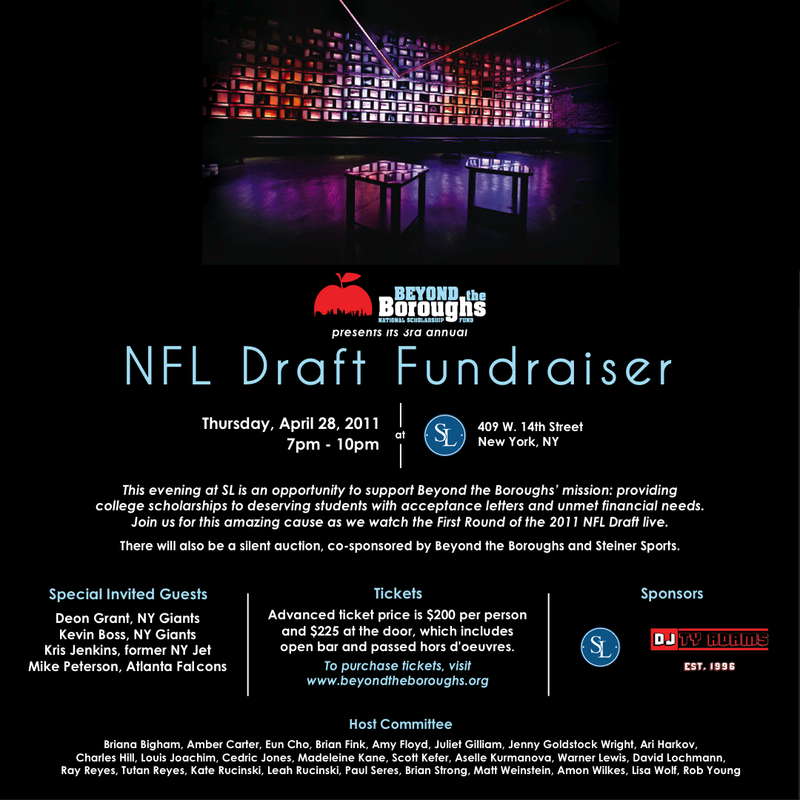 Beyond the Boroughs held our Fourth Annual NFL Draft Fundraiser April 26 at Downtown Dream in New York City! 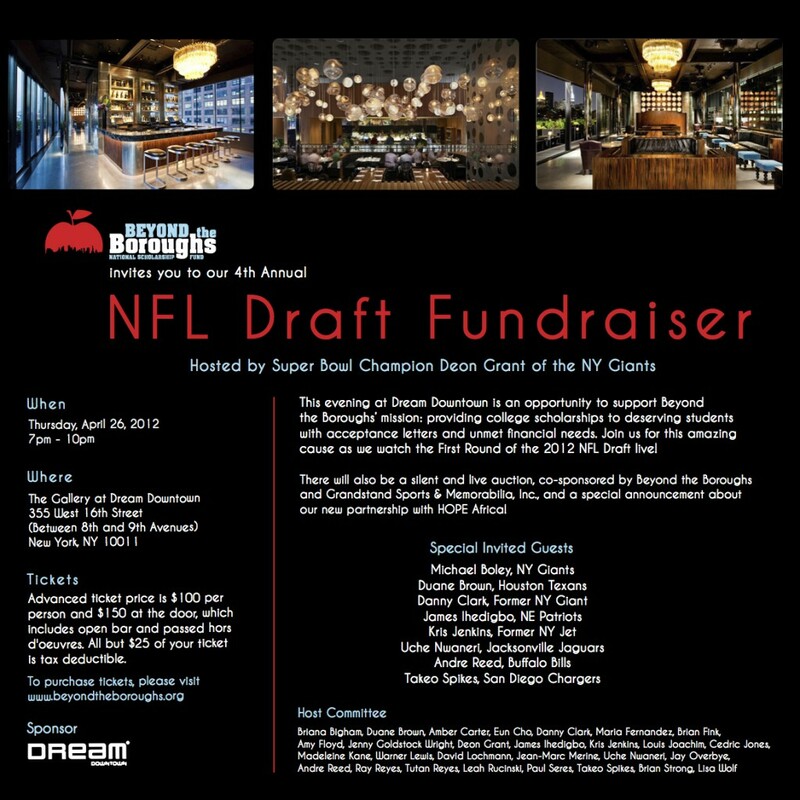 The fundraiser was hosted by Super Bowl Champion and New York Giant Deon Grant. Thank you to all of our supporters who came out to support our mission to help students with unmet financial need gain admittance into colleges and universities across the country! Beyond the Boroughs held our Third Annual NFL Draft Fundraiser April 28th at SL in New York City! Thank you to all of our supporters who came out to support our mission to help students with unmet financial need gain admittance into colleges and universities across the country! Taj Lounge in New York City partnered with Beyond the Boroughs to create “Taj Saves the Music” scholarship fund to reward a high school senior, with a college acceptance letter, a scholarship that will help them begin the next level of their journey. With your help, our goal is to raise $5,000 per year for the next four years. Throughout the year Taj Lounge will be serving a specialty Mojito where a portion of the price will go towards the scholarship fund. 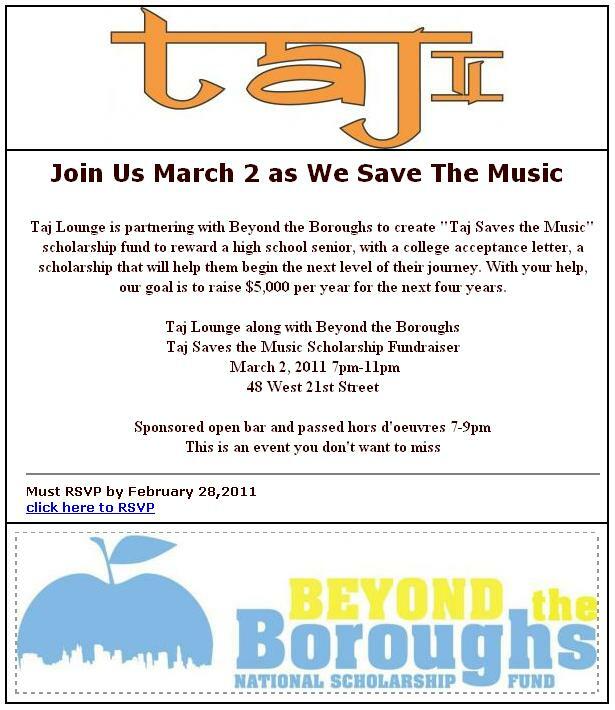 Beyond the Boroughs is excited to partner with Taj Lounge and look forward to selecting a student in 2012 to receive the “Taj Saves the Music” scholarship fund. Taj held their first fundraiser in March 2011 and will hold subsequent fundraisers in order to assist deserving students with attending college. Junior Board Inaugural Fundraiser Monday, December 6th! Beyond the Boroughs Junior Board hosted our inaugural fundraiser on Monday December 6th at The Sugar Bar at 254 West 72nd Street, New York, NY, to watch the New York Jets take on the New England Patriots. Special thanks to The Sugar Bar and Ty Ku for sponsoring our event. Beyond the Boroughs National Scholarship Fund and City Chicks 4 Charity held a Monday Night Football Fundraiser at 50 Deuce Private Loft in New York City to watch the Cincinnati Bengals take on the Pittsburgh Steelers. Proceeds benefited the Beyond the Boroughs National Scholarship Fund. Proceeds from the event benefited The Beyond the Boroughs Scholarship Fund! Thank you to all of our guests who attended! Backed with a determined objective to help others and make a difference through charitable initiatives in the local community, Verizon Wireless One of Riverside is supporting Beyond the Boroughs by raising money for the national scholarship foundation through a fundraising event. It will take place on Saturday, May 8th, 2010, from 11am to 2pm. The event is free to the public, but Wireless One will be accepting donations for Beyond the Boroughs. 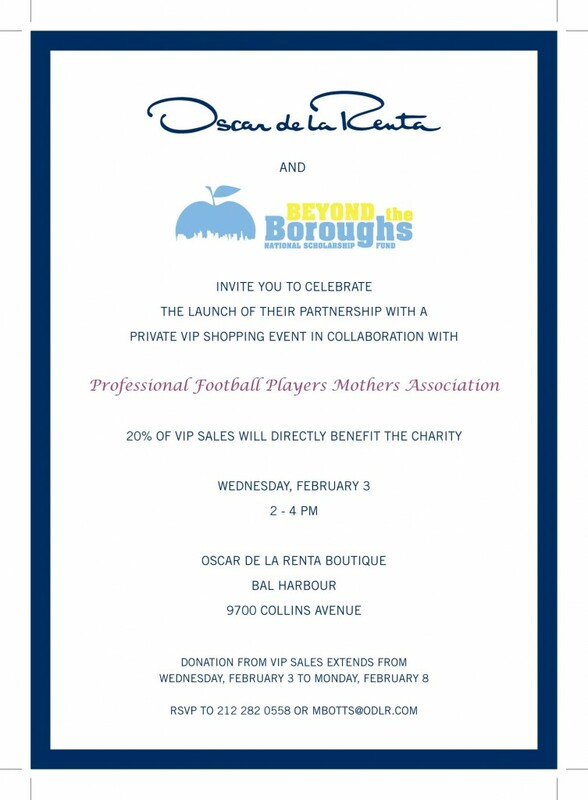 Several professional NFL players will be available for signings at the event, including Beyond the Boroughs founder Tutan Reyes of the Houston Texans, Kris Jenkins of the New York Jets, Sinorice Moss of the New York Giants and Cedric Jones, formally of the New England Patriots. Additionally, Blackberry and Verizon representatives will be set up to answer questions, and will be giving away complimentary Blackberrys and Bluetooth headsets with a minimum donation. Fairfield County’s Classic Rock radio station 95.9 The Fox will also be there, broadcasting live with DJ (Matt Zako), providing music, games, and various giveaways. For more information about Verizon Wireless One of Riverside, or its recent charitable initiative, please contact Chris Severo at (203) 637-5441. Wireless One was founded by Andy Panwar ten years ago when he opened his first location. Since then, Wireless One has grown to 12 locations across Manhattan and Connecticut and has won countless awards. Wireless One has been Verizon’s top overall performer in the highly competitive New England region for the past three years. The success and growth of Wireless One has been attributed to their commitment to bringing customers the latest cellular technology at unbeatable prices. Wireless One employees are trained to have a no-pressure approach, while providing unsurpassed customer service. Wireless One of Riverside opened eight years ago, led by store manager Chris Severo. Thank you to everyone who came out to our 2nd Annual NFL Draft Cocktail Mixer! We were able to raise close to $30,000, and we could not have done it without all of your support. Pictures from the event are below.